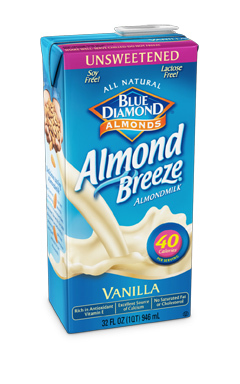 Recently, I was given the opportunity from MomsMeet and Blue Diamond AlmondBreeze to try their newest Almondmilk flavor: Almond Coconutmilk Blend. While it’s not my thing to chug straight from the tetrapak, I came up with a couple of pretty tasty ways to use it – and beat the summer heat! What’s not to love about pudding? Slaving away over a hot stove to make the stuff! Well, how about some cool, delicious and healthy Chia Seed Pudding with AlmondBreeze’s Almond Coconutmilk Blend? And it doesn’t require cooking! 2 Heaping tbsp Ovaltine or other chocolate milk mix to make Chocolate Chia Seed Pudding. Mix everything together and stow it in the refrigerator for 2-3 hours. And of course – the Smoothie! Blend. Pour into tall glass. (teensy umbrella optional) Enjoy! 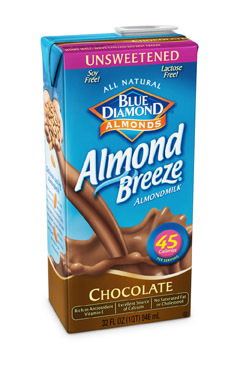 I also tried the above recipes with a plain unsweetened flavor of AlmondBreeze and the results were pretty good, but that Almond Coconutmilk Blend really made my tastebuds pop! Even one of my twins, Halle, became addicted to the chia seed pudding! It’s a great way to get fiber, protein and calcium into your kids! 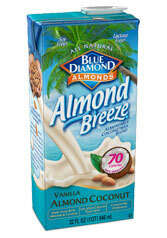 How’d you like a chance to try AlmondBreeze almondmilk for yourself? Thanks to the generosity of MomsMeet and AlmondBreeze, TwiceBlessedLife is proud to host a giveaway with 3 WINNERS!! Each winner will receive a voucher for a free quart of AlmondBreeze Almondmilk Tetrapak! Just fill out the rafflecopter form below! I love unsweetened vanilla Almond Breeze in my iced coffee! I like to make morning smoothies! I love chocolate almond milk just by itself! i just drink it alone! I don’t have a favorite since I have not tried it. I would like to! Honestly, my husband likes to just drink it straight. He was born in another country and drinking almond milk was the norm. I love choco almond milk semi frozen as dessert! The unsweetened kind is my favorite. I’m going to try to use it to make yogurt. I like almond milk in my oatmeal. by itself, but I gotta try the smoothie idea! I use the unsweetened vanilla in my protein shakes in the morning. I’d like to try the unsweetened chocolate too. I like to use the unsweetened vanilla for everything, but my favorite way to use it is for chai. I love almond milk so much more than soy milk. hands down. I like to have it with my cereal in the morning! I love to use it in my sons Mac and Cheese and in my coffee! I’m lactose intolerant, so I love being able to have cereal when I use AlmondMilk! I love to just drink it. It’s so yummy! i like to use vanilla almond milk in cereals and in dessert recipes. i like to use the unsweetened plain for all other recipes. 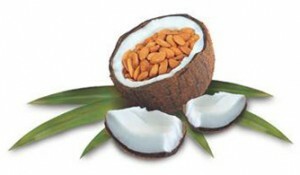 We love to use it in smoothies and milkshakes! I use it in my iced coffee. Haven’t been able to try it yet! i love it on cereal and i use it in cooking/baking in place of regular dairy milk! I like to use it in my smoothies! It makes them extra yummy! I like having milk w/cereal. In cereal is a great way! I take frozen blueberries straight from the freezer and pour the Almond milk over them. I let them sit for a few minutes until they get slushy…..oh my, are they ever good!!!!! Better than ice cream. I love almond milk with my cereal! We use almond milk for shakes! I like using it to make oatmeal. I like to use it in cereal. I have never used almond milk but I would love to try it! I love using Blue Diamond Almond Breeze Almondmilk by drinking it just as it is. Yummy!